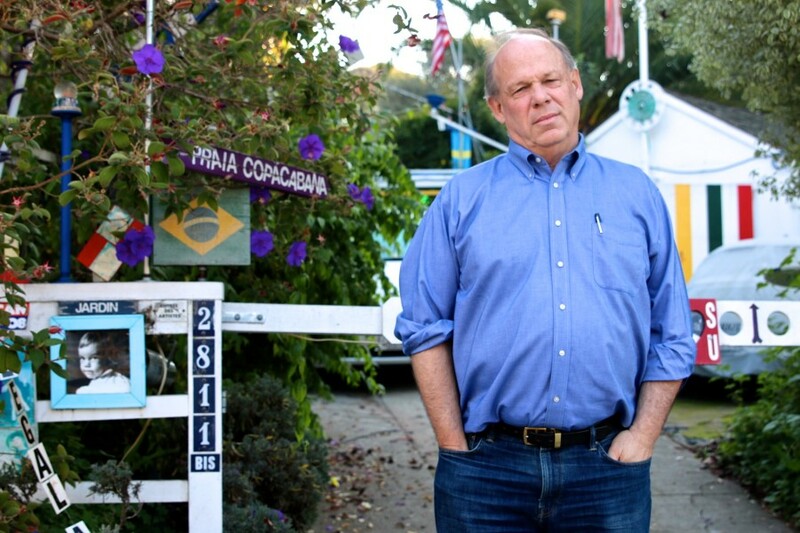 Tom Dalzell runs the blog “Quirky Berkeley,” which is an online attempt at cataloguing Berkeley’s cultural identity. His posts range from photos of front-yard dinosaur figurines to large-scale murals, all narrated with his own brand of enthusiastic quirk. Not only does Dalzell uncover these public exhibitions of Berkeley weirdness, but he also often delves into the history behind these pieces — who knew that Ludwig Fountain in Lower Sproul Plazawas named after a charismatic German shorthair pointer? In doing this, Dalzell reminds Berkeley residents of their city’s history and posits the importance of a self-expressive lifestyle. The Weekender sat down with Dalzell in front of 2811 Hillegass Ave. (a perfectly peculiar Southside home) and talked about conformity, the connection between wealth and quirk and a giant orange. The Daily Californian: So how did Quirky Berkeley start, and what motivated you to start taking these pictures? 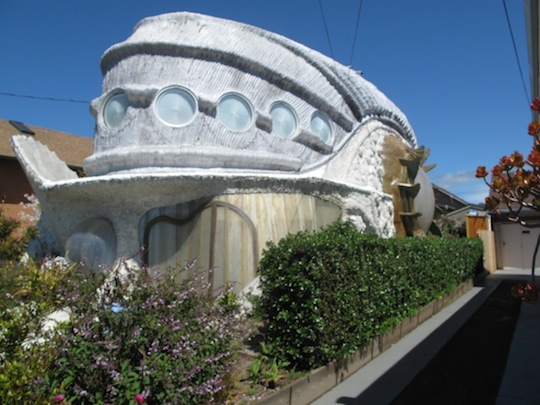 Tom Dalzell: Well, I’ve lived in Berkeley for 30 years, and you just start noticing things like this house or other big things. And then I just like projects, so I said, “What if I walked every block of every street in Berkeley, you know, 200 miles and then blogged about it.” It just seemed like a good obsession, and I started, and I have the compulsive behavior of following this obsession. There’s the big things and little things all over. Little ways that people express their individualism and lack of conformity. DC: What’s your approach cataloguing these sort of things? TD: I have a map — the part of Berkeley that’s a grid is very easy. When you get up into the hills, it’s all topographical rather than a grid. I try to walk with someone because two sets of eyes is better, and we just walk slowly being nosy. I got my iPhone that’s in the car with my daughter at the moment and a book and my map. Once a month, I travel around on the weekend with a real good photographer who’s for fun helping me with some of the better pictures. DC: How do people respond to you taking pictures? TD: People have come out and asked me what I’m doing, and here’s what I’ve been mistaken for: Kelsey Grammer, George Shultz (a former secretary of state), a social worker, a policeman and an elevator inspector. Sort of a straight-looking older white guy, walking, and I got my notebook and look sort of official. But people come out and ask and they love the idea, and they’ll say “Have you seen such-and-such around the corner?” or something like that. You know, down on Martin Luther King, a woman named Jane Norling has a mural in her backyard that she originally painted in San Francisco on Balmy Alley on fences, and when it was going to be torn down, she took the fences and put it in her backyard, and my photographer was holding his camera over her fence. She looked out the window, and she saw this camera up in the air, so she came out and asked, “What are you doing?” It turned out that I knew her husband from a union organizing drive in 1976. People are sometimes curious to start with, but they like the idea. It really resonates. DC: Why do you think it might be important that the Berkeley community maintains a sense of quirkiness and nonconformity? TD: Well, I don’t know if it’s important or not, but it’s there. I like it, and it’s for somebody else to decide whether it’s important. But it’s there. And it’s always been there. If you go back to the early 20th century, I mean, there were people with money living up in the hills. They called it “Nut Hill,” up off of Cedar and La Loma, and they were living in the open air, wearing Roman togas, eating raw food and dancing with Isadora Duncan! There’s always been some degree of individualism here. It really started turning with the Free Speech Movement and then the later ’60s with Vietnam and People’s Park. But there’s always been some degree of this difference. DC: So what do you think it is that differentiates Berkeley from other communities that might seem a little more homogenous? TD: I don’t know, but the university plays a huge role. But there are other universities — Palo Alto isn’t particularly quirky. That’s a question that does interest me, and I don’t have an answer. Part of what makes Berkeley work is the friction between academia and nonacademia, wealth and nonwealth, white and of-color, and that’s one of the things that makes Berkeley work, but why is it that we feel free? If not the need, certainly the freedom to do things you don’t see other places, in the yards. DC: In that last segment, you touched upon how socioeconomic status might play into this — do you think that it is something that affects an area’s quirkiness? TD: Yes, it does, and I have not perfected my theory on that. If the neighborhood is too wealthy or too poor there’s not that much quirkiness, but when you get into neighborhoods in transition where artists move in. … But here we’re on Hillegass, and these are million-dollar homes. This is not the wealthiest neighborhood in Berkeley, but(it’s) certainly wealthy. Walking up and down the streets, we wouldn’t find a lot here, but then we do find this absolute zaniness here. And one thing that you see is that when somebody does something quirky in one house, neighbors tend to imitate. Like, if somebody does a cow for a mailbox, then you’d go a couple houses down and see a cat or a pig or something. It grows, it’s infectious. DC: Do you have any particular favorite things you’ve found? TD: There are two things, and that becomes sort of personal and very subjective, but on 722 Spruce St. there’s a giant orange. 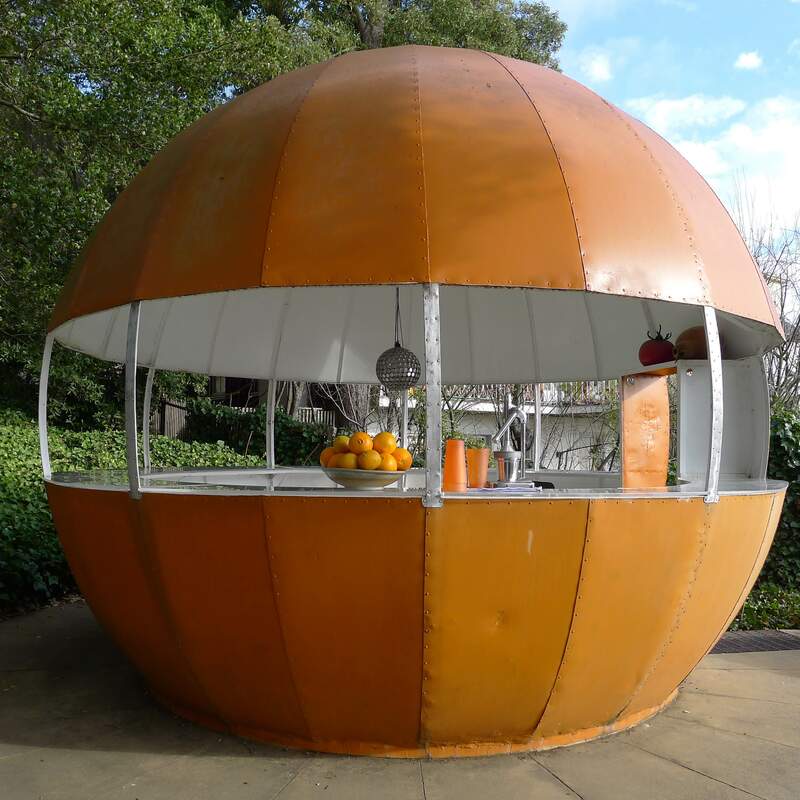 In California, when you drove up and down Highway 99 in the 1940s and ’50s, on the roadside, there’d be these giant oranges serving cold orange juice. Cars didn’t have air conditioning, so you would stop and sit in the shade and they’d serve from a giant orange. A man named Bruce Dodge who lives on Spruce Street bought one. It was being used as a chicken coup. Cleaned it up, rehabbed it and it’s just sitting in his driveway at 722 Spruce. That’s one of my two favorites. Then the other is down on Fifth Street, just south of Paige Street — there’s somebody who has a caboose in their backyard. They originally used it as an office, but now I think it’s just a little rental. Those are my two favorites, but there are some wild things. On Talbot Street there’s this wild house, and there’s a little tableau in front that’s got the Virgin Mary, Snow White, Cinderella and Barbie sort of grouped together, and I just love that. Up on College Avenue, there’s a Virgin Mary on a tree stump with a circle of the Seven Dwarfs around her. It’s those juxtapositions, with little things and big things. And I keep finding things! Because of who we are, I thought that once I start walking every block, especially up in the hills, I’d start finding more than one geodesic dome because it would have been built in the early ’70s, and I only found two. I found more yurts than domes. Three yurts, two domes! Yurts are winning! The game’s not over, but the yurts are winning three to two. TD: Or a past America. Yeah, exactly, exactly. That’s what strikes me. There’s a cultural writer in Berkeley named Greil Marcus, and he wrote a book called “Old, Weird America.” That’s just a title, but it sticks with me. The orange, the roadside vernacular architecture — it’s old, weird California that gets plopped down in Berkeley. Or the caboose with the steam train — plopped down in Berkeley.